In spite of the terrible weather conditions there was a good turnout for the Belfast Celtic Society AGM on Tuesday 20 th October at the West Belfast Sports Club. Once again, the hospitality extended by the venue staff was top class. It was great to see Society president Jimmy Jones and his son Trevor, who made the journey from Lurgan and another former player Gerry Burrell was also present. Paul Campbell, son of Johnny, represented the Campbell family, while there was the first attendance at an AGM of Liz Hargreaves, a relative of Lish Scott who played a key role in the work at his graveside over the summer months. The meeting began with a warm word of tribute to former committee member Jimmy Donnelly, who has decided to step down as Society Vice President this year. The Society will be forever grateful to Jimmy for his help and encouragement and we look forward to seeing him at future events. Chairperson Padraig Coyle outlined some of the society’s achievements of the past year. In January we had a terrific night at the West club when the Bill McKavanagh slide show was shown to a packed house. There was a double event on July 18th when the society marked the 50th anniversary of Lish Scott’s death at his grave in the City Cemetery. 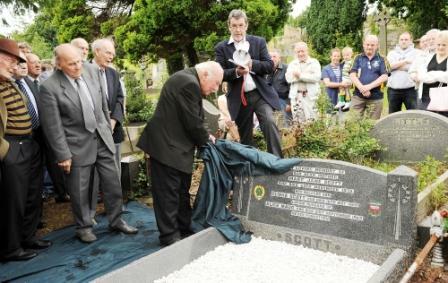 The grave had been tidied up and the crests of both Belfast Celtic and Liverpool were carved on to the headstone. Guests of honour included 90 year old Billy ( Lish’s son), Jimmy Jones, Alex Moore, Ossie Bailie, Stan Duncan as well as Jim and Val Walker , who travelled from Edinburgh. The families of many ex players were also represented. The huge crowd present continued down St James Road for the unveiling of murals to Jimmy Jones, Charlie Tully and Paddy Bonnar. These had been painted by local young people under the supervision of artist Martin Dillon and community youth worker Damien Lindsay. Damian and Martin were present at the AGM and Damien spoke of the success of the project, relating that the mural project has turned a focus of community tension into a source of community pride. Padraig Coyle also gave some detail of the society’s efforts to promote the history of the club. Work is ongoing to establish a tourist trail in the west of the city. Celtic Circles will be placed at significant places to mark where former players were born or where they are laid to rest. A brochure will also be designed which will be available for visitors to the city. The Society is also supporting a plan by the Ulster Sports Museum Association which is working to create a permanent sports museum near the city centre. As part of the celebrations to mark the reopening of the refurbished Belfast City Hall, the Belfast Celtic Society is providing some material for a month long exhibition which opens at the end of November. On display at the AGM was a selection of Belfast Celtic related photographs that had been newly framed. As part of the Belfast Celtic Society’s aims of building stronger links with other groups, it was a delight that Michael Boyd, the Community Relations Officer of the Irish FA, accepted an invitation to come and speak at the AGM. He outlined details of the work that he is involved in to eradicate sectarianism and racism from local football. It is hoped that early in 2010 that we might be able to have a get together with supporters from another Irish League club. It is hoped that the forging of this new link with the Irish FA can help spread the message of our work and build new friendships with other football families. We are pleased to note that Michael, whose great grandfather may have been a Belfast Celtic player, joined our society. Those present were able to watch a short history presentation that Padraig had put together, while an excellent power point presentation reflected on some of the news coverage which the Belfast Celtic Society has received in the past year. And as part of the evening’s entertainment, talented Belfast singer songwriter Gary Maxwell came along and performed a couple of songs, including one that he has written about Lish Scott. We hope to hear a lot more from Gary in the future. Last year the Belfast Celtic Society nominated The East Belfast Mission as the recipients of the annual Christmas charity donation. This year we are donating £500 to the Northern Ireland Children’s Hospice and it is pleasing to note that thanks to the generosity of those present at the AGM, we are able to fund that donation from money we raised on the night. While the committee was sad to see that Jimmy Donnelly has stepped down, we are delighted to announce that Charlie Tully junior has been co-opted on to the committee. In the New Year we will be announcing more details of a special Charlie Tully website which will be linked to the Society website. Re-elected for another term of office: Padraig Coyle – chairperson. Vincent McDonald - honorary secretary. 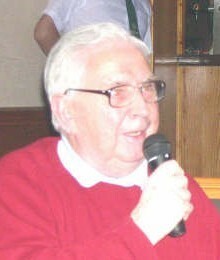 Paddy McIlroy – honorary treasurer. Marty Flynn - press officer. Eddie Whyte – internet co-ordinator. And new Committee member Charlie Tully Jr.